It has become rare under ever tightening money transfer laws - allegedly because this helps fight "terrorism" - to be able to issue an alert that may help those cautious Germans who survived the markets Tsunami of 2008 to repatriate money from tax friendly Austria back home. Legions of German savers with money deposits at Austrian banks appear to have turned into silver bulls. Top quality German weekly "Spiegel" on Saturday revealed a legal loophole in German and EU laws that allows Germans to repatriate 6-digit funds in a most discreet, but still legal way from Austria to their home country. This makes me understand the delighting record profits at the Austrian Mint in 2008 with a high degree of chance that 2009 will end with a still bigger income figure as sales have already exceeded last year's numbers. The object of desire is 37 millimetres in diameter and made of .999 fine silver. On one side, the coin shows an organ, its country of origin ("The Republic of Austria") and its face value: €1.50 ($2.12). On the flipside: "Vienna Philharmonic Silver" and a few musical instruments from the world famous orchestra. 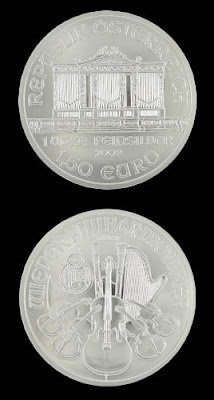 The coin, known to numismatics as the "Silver Philharmonic," could well drive Germany's already harassed Finance Minister Peer Steinbrück over the edge. Because the ounce of silver is a hot tip among German investors -- and a means of discretely transferring untaxed funds back home. Austria issued the new coin in early 2008, wisely anticipating the consequences of the bank collapse, the stock crash and the rising value of precious metals. The coin was explicitly intended for purposes of investment, not collection. Bernhard Urban, marketing spokesman of the Austrian Mint, modestly calls it "unique" in Europe. The story of its success has to do with a funny little contradiction: As a means of payment with a value of €1.50, the coin can be used to buy a beer. But nobody in his right mind will take it to the pub in the first place because the exclusive silver piece is worth -- depending on the price of silver --somewhere between €11 ($16) and €14 ($20), and costs that much at the teller's window. It's this difference between the face and market values of the coin that makes it so attractive in the context of international money transfers. The coin manages -- astonishingly -- to circumvent currency import regulations. A person travelling from Austria to Germany is allowed to bring €10,000 ($14,000) into the country without having to declare it at customs. So that person can bring more than 6,000 Philharmonic coins over the border and in doing so, bring home, with each trip, more than €110,000 ($156,000) of his hidden Austrian treasure. It's common knowledge that many Germans make use of the discrete accounts in Austrian banks. But it's equally clear that the days of strict banking confidentiality are numbered. Bavarian customs officers claim not to have noticed anything yet. But in Austria, the Philharmonics are already "an absolute hit," as coin expert Urban proudly proclaims, especially among the Germans. Like the entrepreneur from Munich who picked up the nifty little tip from his friends at the yacht club. Since then, the coin trick has been doing the rounds among wealthy Bavarians who stash their money next door. Because the coin collectors are exchanging tax evasion tips galore in chatrooms, the Bundesbank (Germany's central bank) is not anxious to draw attention to the matter. But senior bankers are abundantly aware of the problem. The German Finance Ministry has responded by warning inventive investors not to get too comfortable. Customs officers suspicious about coins can forward these concerns. But they can only confiscate the silver pieces if they exceed the face value of €10,000 ($14,000). "We want to fill a vacuum"
Of course, Urban denies that the Philharmonic is making life easier for tax evaders. That certainly wasn't the coin's purpose, he says. It was obvious that investors would go for precious metals in these uncertain times. "We wanted to fill a vacuum that the banks have left behind." Which means: for the growing number of customers who don't trust the investment advisor at their local bank, the Philharmonic offers a perfect alternative. It's impossible to know how many Germans are using the coin for investment purposes and how many for cross-border transfers. What's clear is that the Bundesbank is not benefiting from the silver boom. German citizens are holding back on domestic coins at the moment; German coins are good only for collecting, not smuggling. Silver mintages have become shelf warmers. Now it's too late for the Bundesbank. The Austrians were first to grasp that in bad times, it makes more sense to mint investment opportunities rather than collector's items. As there is not much else to say, Spiegel being reknown for decades of faultless reporting I want to add a few interesting details that may support the never ending allegations about a huge suppression scheme in silver prices. This balance sheet item exclusively subsumes the claim on the Austrian Federal Treasury from silver commemorative coins issued before 1989, based on the 1988 Coinage Act as promulgated in Federal Law Gazette No. 425/1996. Any amount outstanding on December 31, 2040, will have to be repaid...from 2041 to 2045 in 5 equal installments. The federal liability came to € €1.183 billion on December 31, 2008. In short this means the Austrian central bank is at least €1.183 billion short silver (indeed and not with COMEX-contracts) as it is highly unlikely that coin owners will sell them at former Schilling face values of 5; 10; 25; 50; 200; 500 Austrian Schillings (divide all figures by 13.7603 to arrive at the € face value) when the pure market silver value means gains pf up to 3-digit percentage ranges, depending on face value and silver fineness of these coins. Find more details on the resale value here. Although all these figures are minuscule in comparison of Eurozone banks borrowing €442 billion for 12 months from the ECB it may be another grain of salt, that central banks might be keen no to see silver rising further. In my personal opinion I see 3-digit €/$ prices for an ounce of silver. So it may not be a bad idea to keep all the silver you have and maybe buy a little more at current prices. There are many costly traps for physical silver buyers in Europe: Austria still applies a horrific 20% VAT on the monetary metal, absolutely defying any other logic than impeding investors from buying silver. Germans have to give less of the purchase price to the taxman. In Germany, silver coins with a face value and being legal tender, are only levied with 7% whereas VAT on bullion bars is a hefty 19%, defying any logic than maybe "protective measures" to a yet officially unknown winner in the tax game. Austrians can unofficially evade the 20% VAT up mark, a clear discrimination to the other monetary metal gold which is VAT free (making the whole affair look like a political and not logical decision), by buying their coins in Germany or from German sellers on ebay. This means that Austrians can get Philharmonics cheaper in Germany, or on ebay Germany, than at home. They too, can import a 6,000 silver Philharmonics from Germany, saving 13% VAT percentage points and stay within the bound of Austrian and EU laws. It might be interesting to find out whether these rules also apply in other countries. The USA requires travellers to declare monies above $10,000 face value. It is up to one of my readers to find out - best with the advice of a lawyer - whether one could also import Austrian silver Philharmonics up to an exchange rate adjusted face value. This would result into a handy transfer of 4,761 ounces without alerting the IRS or immigration. Non-EU citizens can hit another bargain: As they are VAT exempted, they can get an immediate cash refund of the 20% VAT asked by the Austrian commercial seller at the VAT refund offices at Vienna's airport by simply presenting their purchase records. For those without knowledge of Europe's laws it may be helpful to know that Austrian banking secrecy laws will protect foreign depositors as Austria does not pass on information to foreign tax authorities that would reveal their holdings outside their domestic tax legislative. But the EU Moloch in Brussels will probably pressure Austria to reveal such intimate details in the medium term. So better buy your legal tender Austrian silver Philharmonics tomorrow than the day after.